DeVilbiss Oxygen Concentrator | BUY Home Oxygen Concentrators - 525DS - 525SRE. Compact 5 Liter Oxygen Concentrator with Oxygen Sensor, 3 Year Warranty - SHIPS FREE! 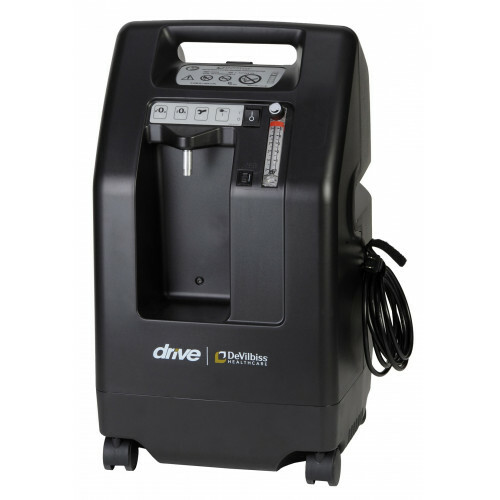 Devilbiss Ultra Quiet 5 Liter Oxygen Concentrator, 3 Year Warranty - SHIPS FREE! DeVilbiss Oxygen Concentrator is the smallest size home oxygen concentrator on the market. That makes the DeVilbiss Concentrator easier to transfer from room to room. The small size of this concentrator makes it less obtrusive in the home and produces an oxygen output of 5 liters per minute (LPM). Containing a recessed humidifier nook, this home oxygen concentrator is equipped with a two-piece cabinet for ease of maintenance. The DeVilbiss Home Oxygen Concentrator is feature rich and comes at a low price, making it our best selling home oxygen machine. In fact, the DeVilbiss Concentrator ranked first in a Comparison of Top Home Oxygen Concentrators. 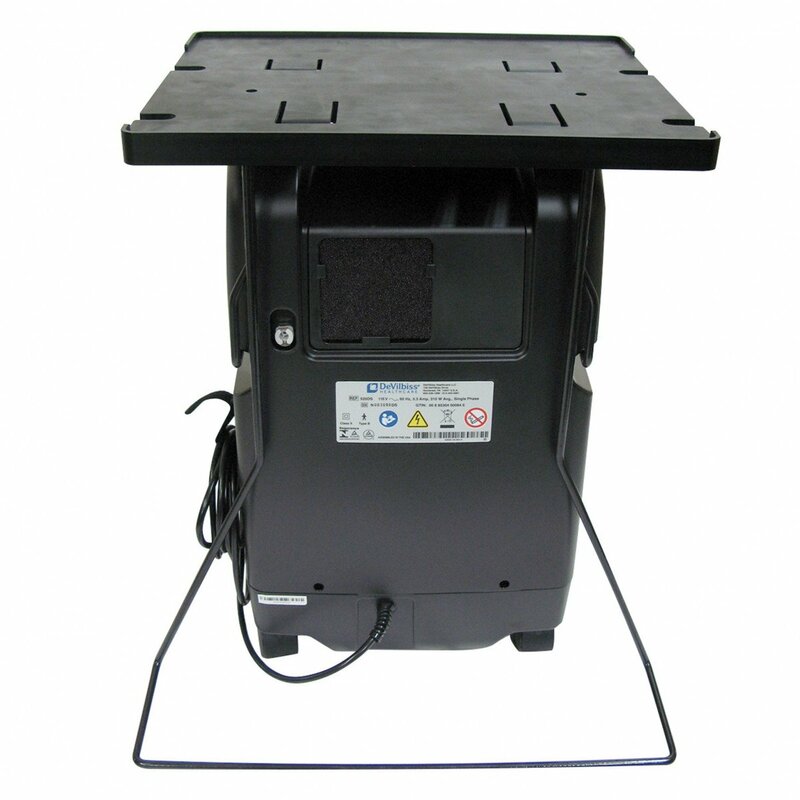 DeVilbiss Oxygen 5 Liter Concentrator comes with a 3 year warranty. This at-home concentrator is ideal for patients who lead an active lifestyle. Robust design for improved durability. Exclusive DeVilbiss OSD® (Oxygen Sensing Device) standard on every unit — increases accuracy and reliability for longer service intervals. Intake filter features a translucent back to allow technician to quickly determine if the filter is dirty. Readily accessible patient controls and protected cannula fitting. 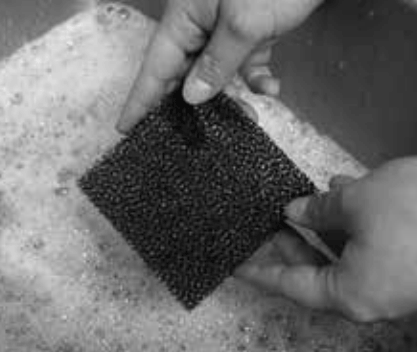 Low maintenance requirements - weekly cabinet filter cleaning. Recessed humidifier nook prevents damage. Easy to assemble/disassemble two-piece cabinet for ease of maintenance. Low, pediatric flow meter available by special order (515LF-607). Call 877-418-9187. Convenient top and side handles for easy transport. Accommodates up to a 50-foot cannula (15.3 meters). Pressure-compensated flow meter to ensure accurate flow display. Pressure-relief valve and thermal protection on the compressor. Double insulated unit; two-prong plug. Alarm functions do not require a battery. Lowest price 5 liter oxygen concentrator. DeVilbiss Concentrator Product Number: 525DS. 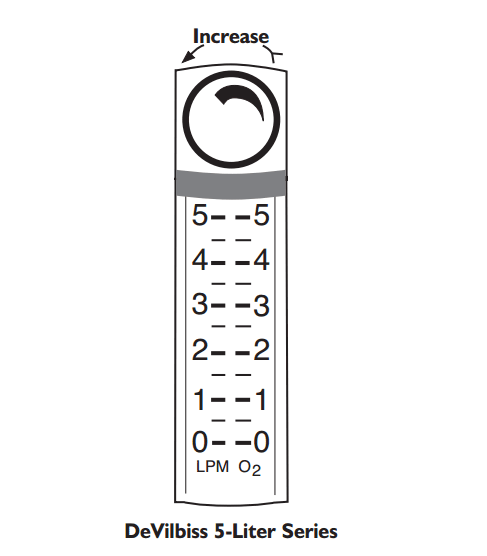 Oxygen Output (max): 5 LPM. 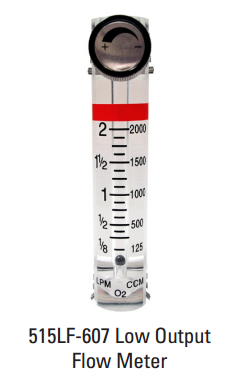 Oxygen Outlet Pressure: 8.5 psig. Oxygen Purity: 93 Percent +/- 3 Percent. Power Consumption: 310W (270W @ 2.5 LPM or less). Certified Oxygen Concentrator Specialist - Questions about the DeVilbiss 5 Liter Concentrator or any of the other oxygen concentrators can be answered by telephone with one of our Certified Oxygen Concentrator Specialist. These trained specialists are re-evaluated every six months to ensure they are on top of the latest technology and the newest oxygen therapy delivery devices. 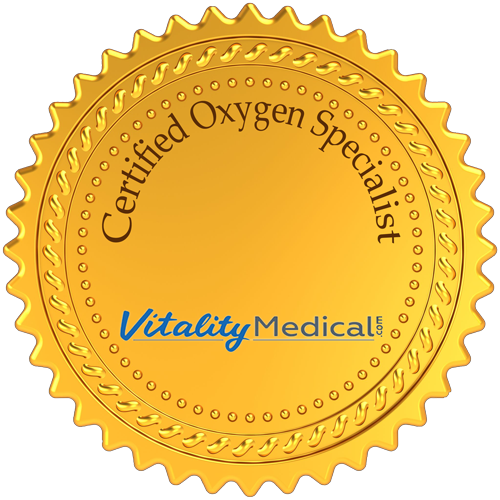 These certified specialist can help you with questions about pulse flow oxygen, continuous flow oxygen, oxygen concentration levels, high altitude operation, oxygen therapy while traveling, as well as questions about specific concentrator specifications. Call toll free to 877-418-9187 to reach one of our Certified Oxygen Concentrator Specialist. Rental Program - If you would like to "kick the tires" by trying out a particular concentrator before actually purchasing it, try our rental program. Vitality Medical rents by the week with no limitation on the number of weeks. Try before you buy and take all the time you need to test, try and learn how to use one of the leading edge portable oxygen concentrators on the market. Often oxygen patients want to take a portable oxygen concentrator with them while traveling since home oxygen concentrators are too bulky and do not work with many foreign power grids. Vitality Medical has several lightweight portables approved by the FAA for airline travel that can be operated 24/7 while on your vacation. Call today for details at 877-418-9187. Easy Warranty Processing - Should your oxygen concentrator require repair while it is under warranty, just give us a call on our toll free line to set up your warranty repair at 877-418-9187. Remember, Vitality Medical offers a free loaner while your concentrator is being repaired. Warranty processing is only for concentrators purchased from Vitality Medical. Oxygen Concentrator Rankings and Comparison Charts - If you would like to see a list of the top ranking oxygen concentrator choices along with detailed reviews, concentrator rankings and side-by-side comparisons, visit the links to our oxygen comparison studies below for detailed information. DeVilbiss 5 Liter Oxygen Concentrator Brochure provides the features and benefits of this oxygen device. 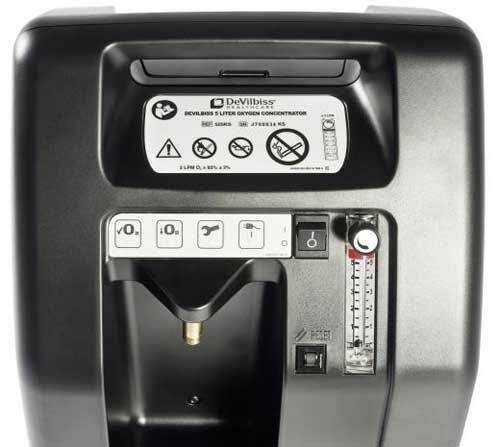 Oxygen Concentrator User Instruction Guide offers guidence in operating and maintaining the DeVilbiss Concentrator. DeVilbiss Oxygen Concentrator Maintenance Log is a handy matrix to record maintenance performed on your oxygen machine. 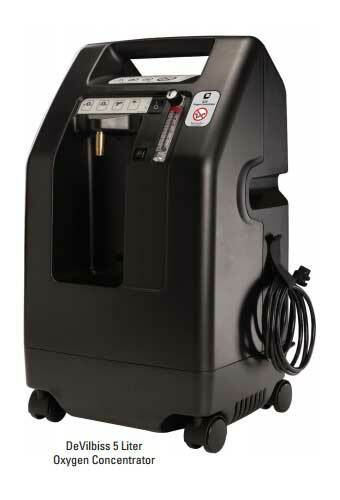 5 Liter Oxygen Concentrator Troubleshooting Guide displays common symtoms and easy fixes. 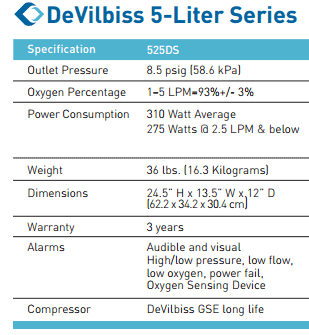 525DS Concentrator Specifications offers a chart with key specificaitons for this stationary 5 liter oxygen concentrator. 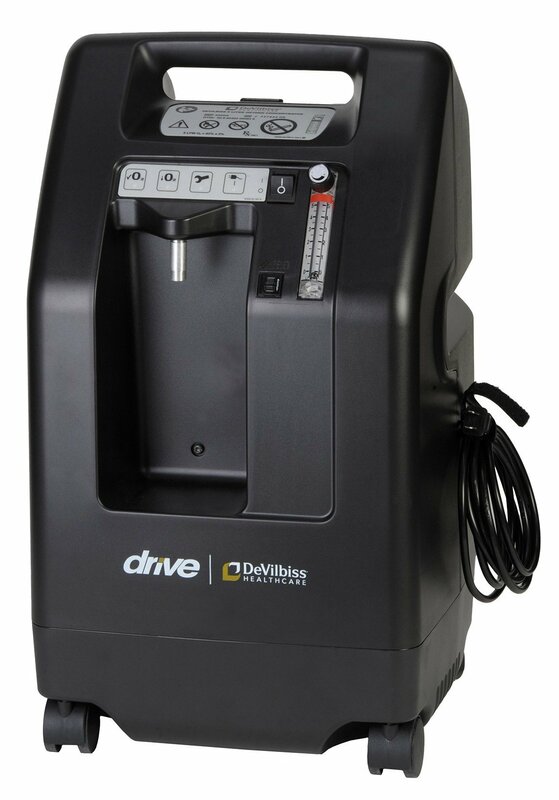 DeVilbiss Manufacturer's Web Page describing the 525DS Compact Home Oxygen Concentrator. Do The Expelled gases from this machine concentrate within the home and cause breathing problems for others within the home? We have a Nuvo Light Mark V currently, since the machine has been in the home everyone has been experiencing headaches and tiredness. According to a statement from the manufacturer: The gasses expelled from a concentrator are what is found in normal air less the amount of O2 that the user has taken in. Unless there is none of extremely like circulation of air from the outside air there should be no problem. Any specific information about the concentrator they are using should be directed to the manufacture. What is the cost to electric bill with continuous use @ 3 liters. Hello Mr. Earls: In order to accurately answer that question, multiple items need to be known. The answer is based on your LPM setting, the amount of hours the concentrator is being used, knowing how many watts are being used based on that usage, then using multiple (but simple) math solutions to come up with a total cost. For accurate information, we suggest researching American Medical Sales and Repair. There is a two-year manufacturer maintenance on the compressor that's recommended. Other than that, simple upkeep on the filters. It is possible to have more than one person use the same machine, though not at the same time. It's preferential to have separate masks and tubing as a precaution. If two people were to use it with an adapter, the oxygen received by each person would be greatly reduced. Is this unit had a built in humidifier? Each purchase includes the oxygen concentrator and an oxygen sensor. All other parts/components will need to be purchased separately. Can I use it as an oxygen facial? Do you have a spa facial mask to buy separately ? This item has not been known to be used for oxygen facials. We do not sell the accessories for such a procedure. My husband needs a 6 lpm continuous flow at night with bipap - Have been told that the 5 liter DeVilbess can be set up to 6 liter. Is that true? The highest continuous flow setting on the DeVilbiss 5L is five liters per minute. There are other options available that will go higher for continuous flow. I see 300W but at what voltage? 110 AC? 115 is the voltage, according to the manufacturer. I see 300W but at what voltage? 110 AC? o 220 AC? Our listed wattage is 310 with the voltage at 120 VAC. In an effort to keep our prices low, we do not bill Medicare or insurance companies. Feel free to contact your local insurance company for information about reimbursement. What is the maximum altitude that the 525DS-Q can be used at? The 525DS-Q works at altitudes between 0-13,123 feet above sea level. What is the maximum altitude where the DeVilbiss 525DS. I need something that will function at 9,000 feet. If this model will not work, what models do you have that will work at 9,000. The Devilbiss 525DS will operate at a maximum height of 13,123 feet above sea level. The advertisement I clicked on said price was $490.00, but this description says $599.00. So which is it? We offer several discounts on items such as this one through an advertisement or by email. For the best possible price, please contact customer care at 800-397-5899. Will this unit support a 50' tubing line? This item is able to work with 50 foot tubing. Do I need a Medical prescription? How do I send the prescription to you? When traveling for a weekend trip this unit does not fit in our trunk and we have to put it in the back seat. Can the unit be laid flat or on its side to fit in trunk? The unit can be shifted around to fit any space necessary, so long it's not being used during travel. Usage requires the item remain in an upright position. Do you have bundles with both stationary & travel units? There is a power cord attached to the machine that will allow you to plug the machine into an outlet. Oxygen Concentrators are able to be used with a CPAP mask. You'll need to run through a list of instructions for the proper connection; however. These units work well and are pretty reliable. BUT if you have a mechanical problem it cant be repaired and serviced locally. Must be shipped to the manufacturer for service and diagnosis. Very costly and time consuming. Isn't quiet, but I didn't expect it to be from the other reviews. I'm glad it's sitting on a carpeted floor. You can feel the whole thing vibrating like something is out of balance. Purchased one because it's cheaper than insurance copay (after already paying twice as much for copays on the rental). O2 concentration is higher than the one supplied by the rental company. We had it set on 3.0 litres and wife's blood O2 ran about 92%. This one is set on 2.5 and her blood O2 is now staying 96% or above. The rental was a different brand but made almost as much noise as this one. Noise isn't as much of an issue for us because I have bad tinnitus so the TV is on 24/7 for noise to help me ignore the tinnitus and for the light so we don't step on any of our several pets. Price was good,O2 output good kinda noisy, didn't bother me but kept my wife awake, I am rather fond of my wife so the concentrator had to go. good machine, exactly what I was looking for. It produces oxygen as advertised. That is the good. But don't expect to keep the "Ultra-quiet" model in your bed room. It emits a tiny beep-beep and a tiny clunk-clunk. All. Night. Long. After reading the specs, I discovered that I paid an extra $50 for a TWO decibel reduction in noise level. What a chump I am. And I wear hearing aides so I can't imagine how much noise it really makes. And, yes, i called Devilbiss because I thought it was defective. Was told to learn to live with it in effect. 1. In addition to the expected white noise hum of the motor, there's a noise every 4-5 seconds that sounds kind of like something hard is being hit with a pick. I asked, but have had no response to the question if this is normal. To sleep with it (the point in my case), I'll need to drown out that noise somehow. 2. The cabinet was not assembled properly and plastic parts that should be inside are outside. The directions say don't open the cabinet under any circumstances. Again, I've had no response or acknowledgement of my email on these matters, sent to two different (apparently correct) addresses 5 days ago. Purchase process was flawless and unit arrived in 2 days. I asked phone rep if the unit was quiet and they assured me it was their quietest model. It's not that quiet. I still here the thump of the pump and the constant drone of the machine running. My old rental unit was quieter. Ordered the Devilbiss 525 DS-Q, got an almost immediate notification it had shipped. I chose the free shipping option, since it wasn't a rush, and still received the unit 8 days after I placed the order, in spite of major storms between California and Colorado that had to have added at least a day to the transit time. Unit was easy to set up and works great.